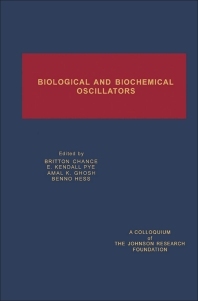 Biological and Biochemical Oscillators compiles papers on biochemical and biological oscillators from a theoretical and experimental standpoint. This book discusses the oscillatory behavior, excitability, and propagation phenomena on membranes and membrane-like interfaces; two-dimensional analysis of chemical oscillators; and chemiluminescence in oscillatory oxidation reactions catalyzed. The problems associated with the computer simulation of oscillating systems; mechanism of single-frequency glycolytic oscillations; excitation wave propagation during heart fibrillation; and biochemical cycle of excitation are also elaborated. This compilation likewise covers the physiological rhythms in Saccharomyces cerevisiae populations; integral and indissociable property of eukaryotic gene-action systems; and role of actidione in the temperature jump response of the circadian rhythm in Euglena gracilis. This publication is valuable to biochemists interested in biochemical and biological oscillations.